Friday’s widespread down candle finally signalled the breakout we have been anticipating, closing the trading session below the psychological USD1.20 price point. Friday’s price action for the euro vs dollar cannot be underestimated and this break below the base of the pennant pattern which has been forming in the past three weeks now indicates a substantially deeper move for the eurodollar in the medium term. My longer term target has always been in the USD1.16 to USD1.18 price band but with many market commentators now openly discussing the complete demise of the euro project, further weakness seems inevitable. However, a word a caution, when market analysts and the wider media begin to forecast the collapse of any market or instrument this is the point at which it generally rallies – you have been warned!. In addition the political capital invested in the euro project would make such a failure unthinkable and ultimately unworkable. 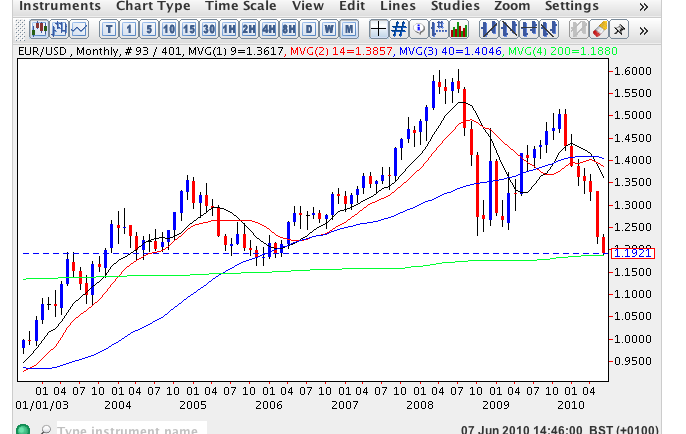 From a technical perspective and moving away from the short term daily chart, the monthly chart now gives us an interesting perspective on the longer future for the euro. 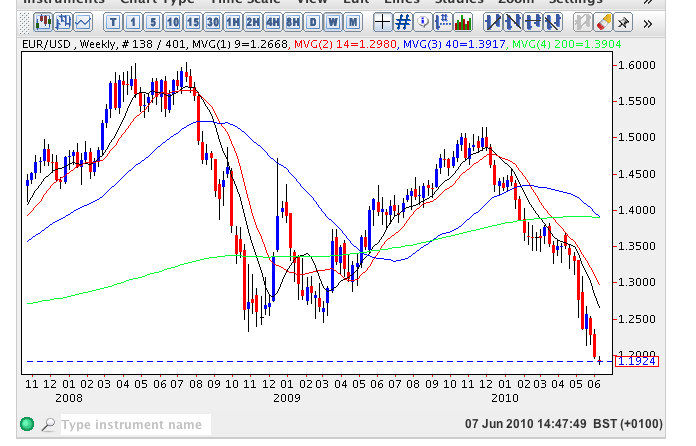 Friday’s low of USD1.1955 along with this morning’s low of USD1.1876 have both tested the 200 month moving average which presents an interesting opportunity for the start of a longer term reversal. Equally, however, should this longer term moving average be breached then ultimately the next logical pause area is around USD1.1000, with parity a feasible option. The weekly chart confirms this bearish sentiment with both the 9 and 14 week averages adding considerable pressure to the current downwards trend and now further reinforced by the 40 week crossing below the 200 week moving average. 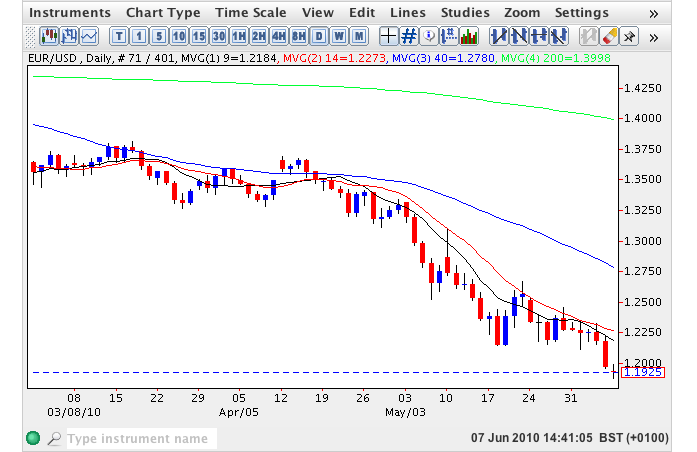 Given the fact there is little fundamental news of any significance on the horizon today then expect the eurodollar to trade in a relatively narrow range and in the short term we may even see a small rally, although this is unlikely to extend beyond USD1.2150 where the 9 day moving average sits. As we have now broken below the pennant pattern any recovery should be seen as an opportunity to consider further short positions with the longer term down trend likely to continue.